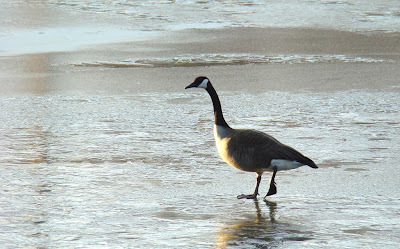 I found this Canada goose wandering across the surface of an icy pond about 7:30 a.m. this morning as I was leaving the cabin for work. A second goose was near this one, and they both looked a little lost. Perhaps they were looking for open water. Perhaps they were eyeing potential nesting spots. They sure seemed to be looking for something that they hadn't found yet. Today's science lesson is a report on what I found out about trees that hold their leaves through the winter. There's a name for it. It's called marcescent leaves. After agreeing on the name, scientists apparently don't agree on much else about it. But I’m getting a little ahead of myself, so let’s back up a bit. Marcescence literally means "to wither without falling off," which is a good description of what I’m seeing with beech trees around the cabin right now. The leaves do fall off eventually, of course, but not until spring when new buds push them off. 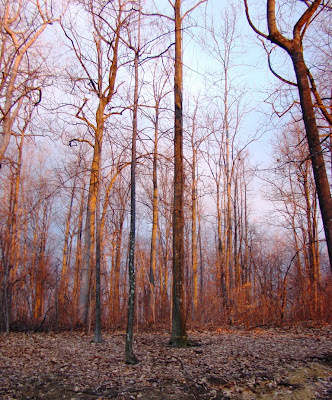 The scientists agree that oaks, hornbeam and beech trees are the species most likely to exhibit marcescence. And they further agree that it’s the younger trees or sometimes the lower, younger branches of older trees that are most likely to have marcescent leaves. Now for the muddy part. No one seems to agree on why it happens. One scientist says that the trees get the benefit of some extra photosynthesis by holding onto their leaves, effectively extending their growing season a bit. Another says marcescence is actually disadvantage for the tree because insects love these dead leaves, and one study showed that trees with marcescence had higher numbers of galls or tumors than trees that didn’t have it. Another study says marcescence is a benefit because it keeps deer and moose from eating the twigs because the attached leaves make the twigs less nutritious and tasty. Another scientist seems to have given up entirely and just said, "sometimes there doesn’t have to be a reason." After hearing a different reason from as many different experts, I gave up. That's enough reasons for me. So here in a nutshell (so to speak) is the story about trees that hold their leaves throughout the winter. Please pick your own reason for why marcescence occurs. Once those leaves finally do fall, it's a pretty safe bet that spring won't be far behind. When I leave the cabin for work in the morning, the light still isn't the best but it's getting there. I chose this photo for two reasons today. 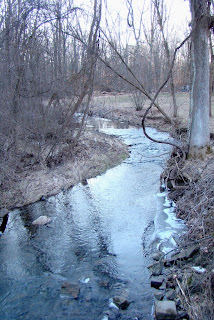 Here it is, just 2 days from the start of March, and some of the trees have still retained last year's leaves. 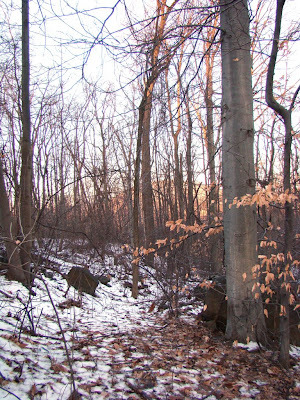 Around my cabin, most of the trees that still have leaves are American beech trees, like the one on the right of this photo. The large beech has lost most of its leaves, but the smaller ones seem to be the ones that have retained their leaves. Granted, these are old and brittle leaves but they are still hanging on. Every year, it's not unusual to see a tree here or there that hangs on to its leaves well into mid or even late winter, but I've never before noticed that this has occurred with a single species of tree. In fact, in previous years, it's usually been one or two old oaks where a branch or two has held its leaves. So why this year have the smaller beech trees held their leaves? At the moment I have no idea but this has gotten my investigatory juices flowing, and if there's a reason, I will certainly try and find it. So what's the second reason I'm posting this photo? 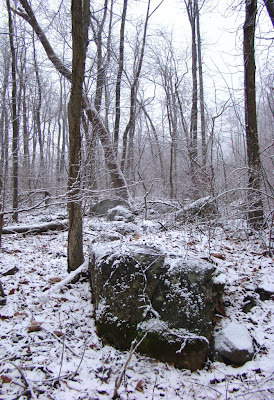 This is actually a photo of the old logging road bed that climbs up the mountain in front of my cabin. This mountain was cleared sometime after the Civil War but before 1900, as best as I can determine. The old road is almost invisible now. The dip to the left and the flat area in the middle are not the mountain's natural shape. 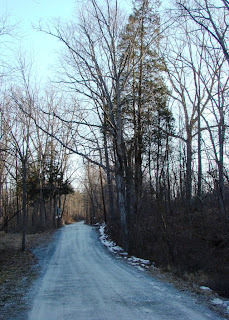 This little section of the old road is visible only in winter. My cabin sits where part of it once cut across the mountain, and the lane past my cabin bisects another piece of it, so its only remains are small sections. Every year, the road is less visible as leaves fill in the left corner of the cut a little more. The mountain is reclaiming its shape. My feeders are normally pretty busy, but it's not every day I get a a Carolina wren, a female northern cardinal and a female purple finch in the feeder at the same time. The photo was taken a few days ago. Yesterday, it rained most of the afternoon, and even though the temperature is below freezing again, I'm starting to think that mud season is beginning. Last night, I sat outside after dark, surrounded by dense fog. I heard the sound of Canada geese overhead, but I'm not certain these were migrants. For one thing, it wasn't a huge flock. The geese called and called, for minutes on end, using their "migration voice," but for some time the sound didn't seem to be going anywhere. By that I mean that I couldn't tell for sure if the birds were moving south to north or north to south or just what they were doing. I suspect the geese were circling, and I wondered if the flock became disoriented or separated in the fog. The morning chorus of residents is underway again. This morning I heard bluebirds, the cardinals, the white-throated sparrow, the juncos and the Carolina wren. The birds certainly feel that there's something to sing about again, so spring must be on the way. 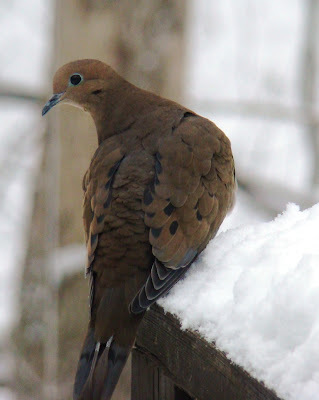 Yes, today's photo is what many would consider just a lowly mourning dove. However, this may be the first mourning dove to ever visit my feeders. I see the birds regularly in the open areas of Roundtop Mountain, but if I've ever had one at my feeders before, I can't remember it. So why is this one (and three of its best friends) here now? That's what I wondered, too, but I think I have an answer. Larry, my neighbor down the mountain, has taken the reins of the snowplowing duty for our common lane. Larry believes in plowing the snow right down to the ground, unlike some of the other plowboys. And, since our lane is dirt, that soon leaves open ground. And the doves, along with many other birds, are venturing into the woods to get at the grit in the dirt. Everywhere else is still snow-covered or paved, so open dirt is in short supply at the moment. I don't consider mourning doves to be the brightest bulbs in the birdy world, but now that the doves are venturing into the woods for the grit, they have at least been smart enough to locate the feeders at the back of the cabin. So for me, having a mourning dove at the feeders is pretty unusual. I wish I could tell you what they were eating, since my feeders are nothing but suet, sunflower seeds, safflower seeds, thistle and assorted nuts, mostly peanuts. There's no corn in there, but the doves were happily ingesting something. Note: Days 5-8 of my 30-day Sit Spot challenge are now posted here. Spring must be near. This weekend when I stepped outside, I heard singing. The cardinals, carolina wren and juncos were all twittering away in the early morning. So even though I have 3-4 inches of snow on the ground, and temperatures that are normal for the time of year, the birds think it's spring. This morning, shortly after 5:30 a.m. I could still see no sign of daylight in the east. But when I stepped outside with Dog, I heard the cardinal singing up in his favorite spot by a beech tree. Now at 5:30 a.m. the only light around is my porchlight, and if that is bright enough to wake up the cardinals and make them sing, then spring must be close indeed. Already the daylight is lengthening, though I've noticed that the birds are pretty quiet by 4:30 p.m. Some light remains in the sky after 6 p.m. but my feeders are empty of birds at least 90 minutes before that. I certainly appreciate the longer daylight, but I find it a little surprsing that the local birds don't seem to be taking advantage of it yet. Perhaps next week. I had a new feeder visitor this beautiful snowy morning. It's a female Purple Finch. I haven't seen a male yet, but the female is a treat. To me, it's much easier to decide if I'm seeing a purple finch or a house finch by looking at the females. When I see the males, especially at some distance or in poor light, I'm always asking if the color is more strawberry (house finch) or more purple (purple finch). Usually, I change my mind eleventy-eight times, and even then I won't be sure I'm right. But the females make the identification an easy one. See that nice eye line on this bird? Purple finch. Female house finch don't have the eye line. The female purple finch's belly stripes are also more defined and paler than the female house finch's. So when I see finches and can't figure out which variety I'm seeing, I look for the females in the group, and that makes the identification an easy one. Did you see the eclipse of the moon last night? I didn't expect to be able to see it, as the afternoon and evening brought me 4 inches of the frothiest snow I've about ever seen. The snow was like bubbles. I could blow it away. As it was still snowing at 7:30 p.m., I figured my chances of seeing the eclipse were nil. So imagine my surprise when I went outside shortly before 10 p.m. to walk the dogs. The sky was clear, and high overhead was the moon, growing smaller and darker with every passing moment. What a beautiful sight. I watched it for a good 30 minutes before the chill drove me back indoors. This morning I needed to run a pre-work errand that took me off my usual route to work. So I took a few photos along the way. Dorsey Lane is one of the last public dirt roads in my immediate area, and in the last year or so this one has been improved to the point where I expect paving is in this road's near future, too. 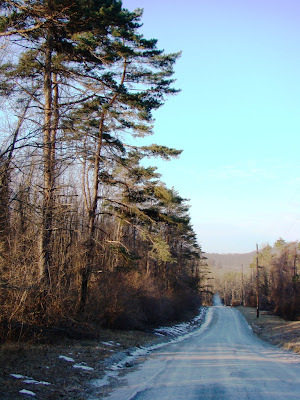 I guess there's nothing really wrong with paved roads, but they sure aren't as pretty as a nice dirt road. This road has now been graded and cleared of the potholes that served as wonderful speed bumps. It's been layered with stones, and I could drive nearly 30 mph on it, a far cry from the 5-10 mph speed that the potholes kept me at just last year. I'm begining to fear that I'm reinventing myself as one of those dreaded "old fogeys" that I scoffed at in my now-distant youth. The more I see of modern improvements, the less I like them. I even wonder why we need most of them. My latest rant is on the upcoming switch to digital TV and the language that I read and hear about it. "The only people affected will be those who have resisted replacing their rabbit ears." I can't tell you how many times I've heard this one. Resisted? The mountain blocks satellite reception, and cable isn't available, so how am I resisting replacing the rabbit ears on my 13" TV? Now I have to buy a converter box than may/may not work with my so-so reception. Please, don't get me started. Oops, it's too late. Yesterday's warm weather made most of the snow and all of the ice disappear, so this photo wasn't taken today. But I like the shot and wanted to post it, so here it is even if it's not how the mountain looks this morning. The photo is only 3 days old but compared to the iceless and nearly snowless mountain I saw when I drove off the mountain today, to me the photo already looks like ancient history. Colder temperatures are back this morning, so the drippy, sticky, soggy mud of yesterday is frozen again. Boy, does that make walking easier. Dog and I had a nice, long walk this morning. 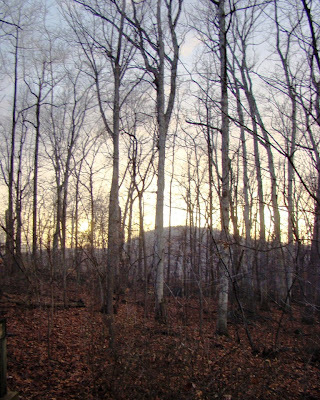 North wind howled atop the mountain all night and was only slightly diminished this morning. It felt wicked outside, though the temperature was just under 30. The wind always makes Dog want to run, so run he did like a kid at recess. The lenghening daylight is more obvious with each new day. At 6 a.m. now I can even see a little bit of color in the eastern sky. Both before and after work, there is enough daylight for me to see at least some of the birds that visit my feeders. That alone makes me enjoy the winter more. This morning I had a pair of red-bellied woodpeckers, a downy, the Carolina and black-capped chickadees, the ever-staring juncos, Carolina wren, white-breasted nuthatch, blue jays and tufted titmice. It's already a good day. Note: if you're interested in my Sit Spot journal, a reflection of what I see and hear as I challenge myself to sit outside and observe my surroundings for 20 minutes each day for the next 30 days, you may now visit it here. I've started doing a 30-day Sit Spot Challenge. The challenge is to spend 20 minutes a day sitting outside in a favorite spot and just noticing what goes on in the natural world around you. Thanks to Jennifer from A Passion For Nature for the tip. Although the "official" start of the 30 day challenge was February 15, the sponsoring organization doesn't mind if people start on other days. You can find more information about the Sit Spot here. I've had to sit after dark one day and near sunset on the other two days, and it's been a bit chilly. It's rained on 2 of the days I've sat outside, though not a downpour on either day. Still, I'm finding this an interesting exercise. Even living in the woods, I too often find myself seeing the woods around me only on my way to or from someplace else or while doing something other than simply observing what's going on around me. The Sit Spot is helping me slow down and simply notice whatever is happening. I'm planning to create a new blog where I will post my Sit Spot journal, but I likely won't get to that for a day or two. Weather extremes and oddities continue on the mountain this weekend, though by now, I’m starting to think that "oddities" are the new normal. Ice has now given was to temperatures 30 degrees above normal, though that won’t last past noon today. This morning’s warm weather has brought with it the year’s very first spring arrival. The fog is so dense right now I can see little up on the mountain, so today’s new arrival was heard only. The killdeer have arrived again! I heard several of them, at least 2-3. Obviously, they can’t have been far away if one morning’s warmth is enough for them to appear on the mountain. So perhaps calling them a "spring" arrival isn’t entirely accurate. They likely spend the winter hanging out along a nearby river, and today’s warmth and mud was enough for them to show up and see if their beloved stoned parking lots are still here. Last year my first record of them in the new year was on February 27. Because of the morning’s high temperatures, in a way, I can also say I have a second new arrival--mud. Mud is everywhere right now. A layer of mud even coats the top of the rapidly retreating ice, making many areas very, very slippery. Tonight, the temperatures are to drop back to a more typical range for February, and if the muddy icy isn’t gone by then, it will be every slipperier than it is now. Dog and Baby Dog skid and slide on the muddy ice, and both normally have better traction than I do. I’m wearing "tire chains" on my boots and can get around fairly well. I much prefer snow to either mud or ice, though in the scheme of things, I think I prefer mud just a little bit to the ice. I had to take this morning’s photo down off the mountain this morning, as up where I live it was too foggy for a photo. Sometimes foggy looks mysterious or arty, but sometimes fog is too dense for that. This morning was one of those times. The ice from yersterday's storm is still with me, though it is less severe than yesterday. The roads are better now, though ice still covers the trees. The temperature rose to 33 degrees in the late afternoon, so the mountain got perhaps an hour or so of melting. The feeder birds are taking it all in stride. Perhaps they simply assume I will keep "their" feeder filled. I doubt birds worry about anything, except perhaps for juncos. The juncos are funny little birds around the feeders. Most of the other species zip in and out of the feeders. They grab a seed and go someplace else to sit and eat it. Or, they eat several seeds in the feeder before leaving with one to go. The juncos are different, though. A whole passle of them sit around the feeders all day, staring at it. Periodically, one or more will approach the feeder, eat a few seeds and then retreat to the branches above and beside the feeders to sit some more. They never get but a very few feet from the feeder. It's almost as though they think they have to stare at it all day long to keep it from disappearing in front of their eyes. At least that's sort of how it looks to me. I sure wish I knew what was going on inside their little heads and why they spend all day staring at the feeders. First, a little background. 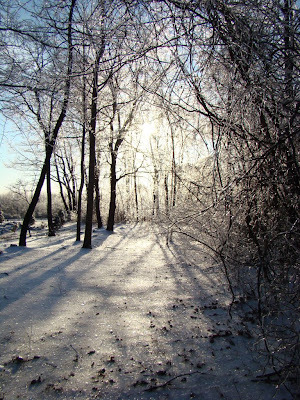 Yesterday, I had 4 inches of snow, topped with an inch of rain that, since it was well below freezing, instantly coated with ice every little twig and branch in the woods. Then the north wind started to blow. The puddles of rain that had no place to flow froze solid. 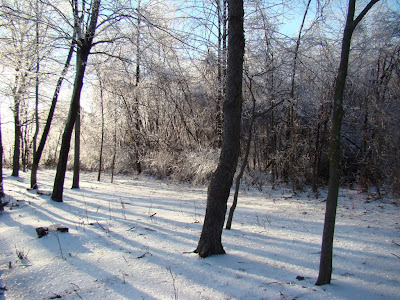 So this morning, everthing is still frozen, it's 17 degrees, and the woods looks like a skating rink. Once I was ready to leave the cabin, I put on the ice treads on my hiking boots, picked up my laptop case, purse, lunch and camera and headed outside. I'd expected everything to be frozen, and I'd also rightly expected that the road past the cabin wouldn't yet be plowed (and at this point plowing was not longer an option. Blasting might work). 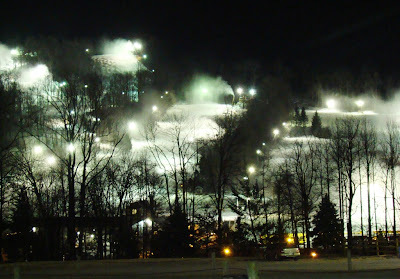 So the evening before, I'd parked the car further down the mountain near an area where I knew Ski Roundtop would plow. It's about a quarter mile from the cabin. So I walked, slid, stumbled and crunched my heavily loaded way down the mountain to the car, which is of course surrounded by ice. I unlocked the car and discovered both doors were iced closed, and I couldn't budge them open. However, the hatchback door would open. So I crawled in the back, climbed over the back seat and into the front passenger seat. Here, I was eventually able to kick open the passenger side door, though not the driver side door. Still, I was making progress. So I turned on the car and fired up the defroster. The car itself is covered with ice, really covered. So I spent the next nearly 30 minutes scraping the ice off the car on every surface I could reach. By this time, things were looking up as the driver's side door would now open after several well-placed kicks from inside. 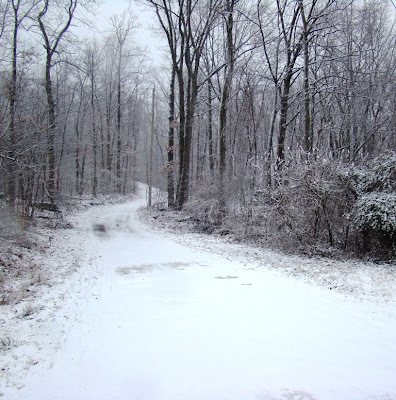 Eventually, I was ready to start driving, so I dropped the car into 4wheel drive and headed out by my normal route. However, the gate that is usually open is now locked so I had to turn around and inch my way to another exit road, where I encountered a very icy looking and obviously untreated hill. I sat there a moment or so and finally decided not to chance it. I turned around again and followed another access road past the ski lodge. Here, I was finally able to reach the public road. Immediately, I am confronted with a large hill, naturally still covered with ice. I start up. I'm able to make it by wandering all over the road's 2 lanes to avoid the worst of the ice, wherever I saw it. At the top of the hill, I dodge one downed tree, then another. Now, I'm heading down the hill, ever so slowly, as a wicked S-curve awaits me at the bottom. I slide slowly through the S-curve and start up yet another hill and find another downed tree to dodge, this one bouncing on wires. And then I am down the mountain and next to an orchard and...suddenly there is no more ice and the roads are dry. What weirdness is this? I feel as though I've just exited the Twilight Zone of Ice. Down here, cars are driving at normal speeds, people are driving with their minds on their cell phones. I'm only 2 miles from the cabin but it feels like 100 miles further south. Down here, life goes on as normal. Back at the cabin ice still covers everything. The trees are still bent double. I still slip and slide and move like an old lady with every careful step. It's another world up there. Boy, what a wild day this was. 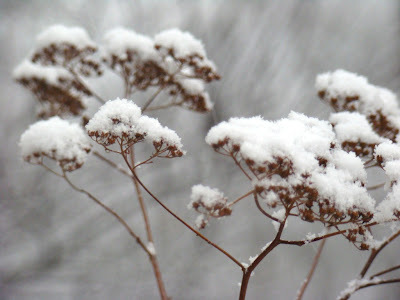 I had four inches of snow, and everything was looking pretty until around 6 a.m. Then it started to rain, even though it was still below freezing. 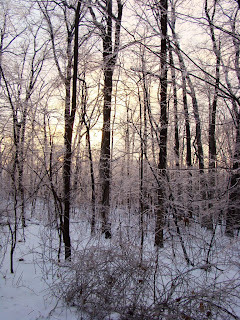 Within seconds the trees were ice-coated. 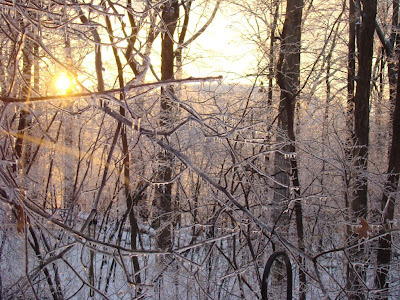 The promised above freezing temperatures never arrived, and now the trees are coated with as much ice as I've ever seen. I still have power, but with 30 mph winds predicted for this evening, who can say how long that will continue. Trees are touching wires just about everywhere I look. The ski resort was closed today. Whether it was because people couldn't get up the mountain to get here or because of the ice or the rain, who knows? It was a mess, that's about the only thing I know. By afternoon, the rain was not abating much, but the local birds were out and about everywhere. 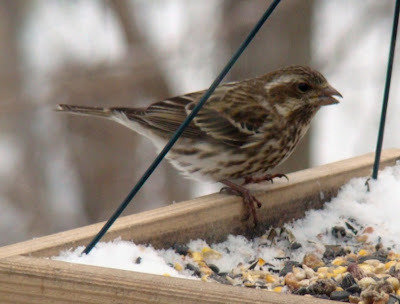 At any patch of open ground, flocks of juncos and sparrows were looking for food and grit. I filled my own feeders three times, and if any of the local birds are still hungry, don't blame me. I didn't see anything exotic at the feeders today, but I had a crowd of the usual suspects. Late in the afternoon the rain finally stopped. I went outside and shook my conifer trees, trying to knock some of the ice off in hopes the trees will be able to recover from the U-shape they're all in now. It was very quiet here today--no traffic, no skiers, no one around. It's already below freezing again, so tomorrow may be another interesting day, though I hope not. Now that the temperature is back well below freezing (and into the single digits), snowmaking has resumed at Ski Roundtop. Last night I was coming back to the cabin late in the evening and thought I'd take a photo of the action. As my readers know, I'm a staunch defender of nature and her ways, but I always find the sight of the mountain lit up and with snowmaking in progress to be a beautiful sight. Natural snow also fell here overnight, though only about an inch. Local schools are closed today, not because of an inch of snow, but because last evening's forecast predicted several inches of snow to be followed by sleet to be followed by ice and freezing rain. It's the ice word that scares the schools. This winter I've seen a lot more ice than snow, more than I care to see. My area of Pennsylvania is hilly. Even the flat land is rolling. 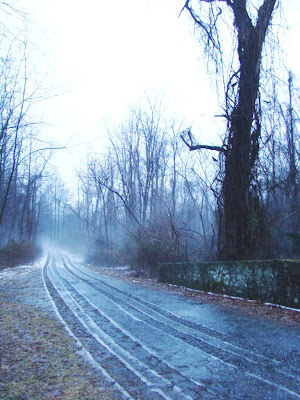 The roads were all created more than 200 years ago along the edges of the property lines that existed at the time. Years later, the roads naturally have been improved but rarely moved. I don't think there's a single straight line or straight road anywhere. So school buses (and other drivers) have to contend with continually winding and hilly roads that, when combined with ice, are often very difficult to negotiate. This morning, the forecast seems to have changed since last night. Now, the snowfall is to be lighter and the ice not to begin until after dark this evening, so the kids are ending up with a day off school when they likely wouldn't have needed to be off. I'm inclined to believe the change in the forecast. This morning, my feeder birds were eating normally and not in their frantic feeding mode that tells me I'm going to get hit with a bigger storm. At least that's my prediction, and for now I'm sticking to it. This weekend a pretty little snow fell on the mountain. This is not as it should be. February should not bring pretty little snows. February normally brings snows that routinely close in on 2 feet deep. February normally brings snows that are as heavy as concrete, and snows that can't be plowed and have to carted away in dump trucks. February brings snows that drift towards the top of my back door. February snows can close the roads for so long that kids are bored out of their minds and are screaming to go back to school so they can hang with their friends. A pretty little snow is so...so... November. But it is mid-February, and all I got is this pretty little snow that lasted a but a few hours. The feeder birds didn't even bother to go into a feeding frenzy. Still, the weekend did provide some interesting weather weirdness. Saturday night lightning was so bad on the mountain that they closed the slopes, but I never heard a single clap of thunder. When I first saw the lightning as I was out walking around with Dog, I thought someone skiing on the nearest slope was taking a photo with an extra bright flash. On Sunday, the wind turned mean and fierce, with gusts over 50 mph, and sustained winds in the 35-45 mph range. I lost power (briefly) 5 times. The power went out so often for a few hours that I stopped trying to reset my digital clocks until I was sure it wouldn't happen again. I didn't get online because the outages fried 2 computers (that I know of) at Roundtop, and I didn't want that to happen to my home computer. All that excitement and I never even left the mountain. Note: Due to my own klutziness, I have managed to delete instead of publish all the comments about the weird red light in my last post. I am not ignoring you folks, truly, my hand just (somehow) jumped at the last second and all the comments got rejected. I'm sorry about that. I'm not sure if I needed more coffee or had too much. After the storm of Wednesday night, the next morning dawned red, casting an unusual light all around me at sunrise. The forest suddenly looks so different to me that it doesn't seem possible it's the same place I know so well. For me, seeing a few minutes of this other worldly color is a bit like taking a small vacation, perhaps one to a Mars where they have trees. The strange tones don't last long, of course, and it isn't long before the forest looks like itself again. As humans, we think of dark places as gloomy, of bright places as happy, fog as mysterious, and for a few minutes this red light even feels like an imagined Martian landscape. The birds and animals in the forest don't seem to notice or care that everything is suddenly red, so I think this sense that a different light creates a different atmosphere or sense of place is a particularly human experience. Animals don't pay much attention to light or even weather, at least not in the way humans do. A severe storm sends animals scurrying, but that's about it. They certainly aren't fair weather creatures in the way that we humans tend to be. Was it always so, I wonder? How much of our aversion to rain or wind or heat (or cold) is a cultural construct that tells us that's how we should behave. Is our aversion simply another way of saying that we are wealthy enough to have a place to go to get inside and get away from all that? And yet, I dream of a time where humans were more comfortable in their surroundings, where a little rain or a little wind or a little heat wasn't enough to drive us inside and separate us even more from the world around us. Note: if you like my blog or nature blogs in general, you might want to check out the Nature Blog Network, where you can find a lot of great nature blogs. If you're a nature blogger yourself, you may want to join and see where your own blog ranks. It's not every day or every year or even ever before that I've come home from work in February to a thunderstorm. But that's what greeted me last evening. Moments after I took this photo of the weird light just ahead of the storm, the lightning was close enough that I scurried inside. The weather during the day brought record-breaking warm temperatures, breaking the old record of 60 degrees by a degree or so. Given that extreme during the day, it's not surprising or unusual that the storm that followed would be atypical as well. As far as I know, my area did not get the tornados that accompanied this storm when it passed to the south. Certainly, I didn't have anything like that at the cabin. Later in the evening another storm crashed through, this one with high winds that reached 70 mph but even that only lasted for a minute or so. This morning the sky is golden and clearing, the temperature already on its way back down to a more seasonal number. Snow is even forecast for the weekend. The weather has been so bizarre, especially during the last year or so, that its weirdness is almost starting to feel like the norm. And that's a much scarier thing than a thunderstorm in February. Last night I was going through a few of my older photographs and came across one of a downy woodpecker, so I thought today would be a good time to put my woods-obscured hairy woodpecker photo next to a downy photo so you can (hopefully) see the difference in the bills. The "bill trick" is how I was taught to differentiate the two species, and it has always worked for me. You really don't need to look at any other part of these two woodpeckers, other than the bill, to ID the birds. The downy's bill is tiny in comparison. 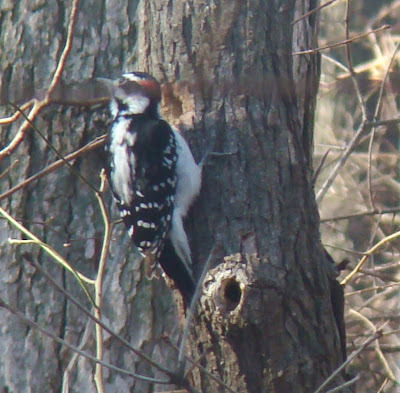 In fact, next to the hairy woodpecker, the downy's bill barely looks woodpecker-ish at all. The hairy's bill is like Jimmy Durante's nose, a large and proud prominance. The hairy woodpecker is quite a bit larger than the downy, but that's not always easy to judge when a bird is umpteen feet away from you in the woods. How the bill appears in relation to the bird's head is usually something that you can see. The difference in the birds' bills also tells you a lot about where you'll commonly find them. The little downy is usually plying the branches of trees. The larger hairy is usually hanging out on the trunks of trees, as in my photo of the hairy. This just keeps getting better. Now I've seen yet another of the regular birds that I missed in January. It was the Hairy Woodpecker. Where were these birds during January? 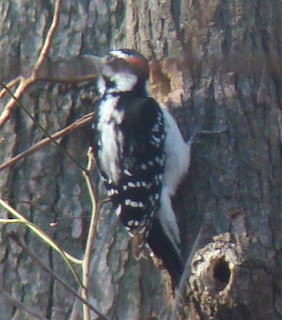 Hairy woodpckers are easily told from Downy Woodpeckers if you see their bills. Hairy woodpeckers have a big, honkin' bill that's about as long as their heads are wide. You can just see the partially obscured bill in this photo. Downy woodpecker bills are tiny in comparison, less than half the width of the head, often just barely peeking past the little tufts of feathers where the bill begins. Hairy woodpeckers are quite a bit larger than downy woodpeckers, but that's not always easy to tell unless the bird is close (and if you are familiar with the size of the more common downy woodpecker). 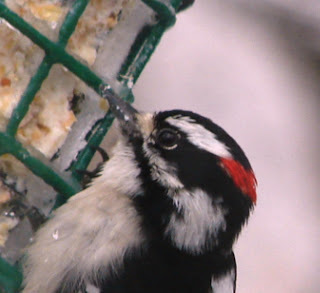 Hairy woodpeckers come to my feeders, but seem much shyer than the downy woodpeckers and startle easily. Well, that's another species to add to the foot-powered birding list (though if I'd seen this bird during January, when I should have seen it, my species count for that month would have reached 29, which is precariously close to theoretical 30 species I hope one day to find in January at the cabin). 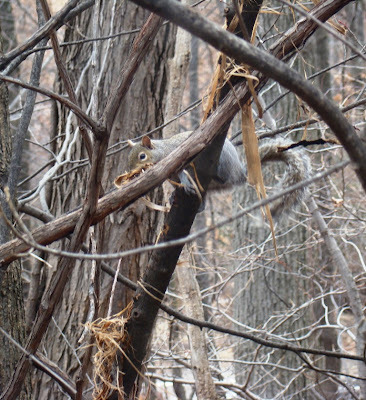 One very persistent gray squirrel has spent most of the weekend shredding the bark on a sapling near the cabin. I think the shredding was begun by non-squirrel activity. A branch near the sapling has been rubbing it for a while, but the squirrel has taken shredding far beyond that minor beginnning. It certainly looks as though this squirrel is starting to gather material for a nest. Typically, squirrels around here nest in late winter. Normally, early February doesn't qualify as late winter, but with climate change, who knows? Anyway, the squirrel provided entertainment for the cats (and me!). If this squirrel is nesting now, the kits could be born as early as mid-March. Squirrel babies usually aren't seen until they leave the nest, which is usually in May-June around here. If the babies are born in mid-March, that will bring them out of the next perhaps in early-mid May instead. By the time squirrels leave the nest, they are pretty much grown, so I don't get to see just how cute the little ones likely are. Wasn't it only yesterday that I was complaining that I hadn't seen a pileated woodpecker for entire the 31 days of January? Didn't I just wonder why I hadn't seen a song sparrow in all of January? So how is that yesterday, in the space of an hour without ever leaving the cabin, that I saw both of them? I didn't get a photo of the song sparrow, so you'll have to take my word on that one, but I do have proof for the pileated. The photo is not the best, but it was taken through my second floor window, looking down at one of the trees next to the cabin. I have about a dozen photos, of which this is about the best. 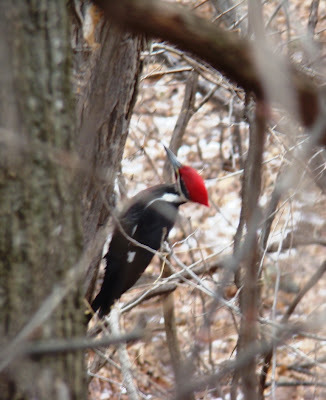 Pileated woodpeckers move quickly, I discovered. So I have blurred photos, photos of the red head only, of the beak only, of the tail only....you get the idea. 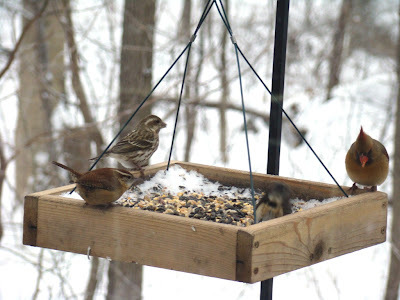 I'd no sooner grabbed this photo and gone downstairs to put the camera away when I saw a song sparrow in the feeder. So, after not seeing either species throughout all of January, both show up as soon as February begins. And before I move on, what's your take on the pronounciation of this species? Are you a "pill-e-ated" or a "pile-ated" pronouncer? I started out as "pile-ated" before I ever heard anyone pronounce it, but as soon as I met a few good birders, they all said "pill-e-ated" so that how I say it now. First, let me apologise for the sub-standard blogging this week. I've been knocked flat by a flu-like thing, and I'm only just now, through the grace of antibiotics, rising up out of that fog. Below is my January foot-powered bird list. The average number of species I usually see in January is 26. This year I saw 26. But it wasn't the usual 26 species that I saw. Now, I have to figure out why I didn't find the Pilieated woodpecker, the Hairy woodpecker and even the black vulture. And what about Song sparrow? One of these years I'll see everything I know is here, plus one or two extra birds. Theoretically, I should be able to hit 30 species in January, but I've never done it yet. 7. American Robin - a very good bird for January 1!